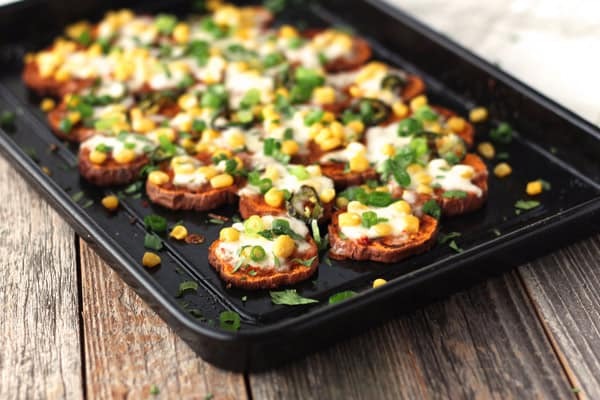 Sweet potato nachos are a quick and easy appetizer for two. 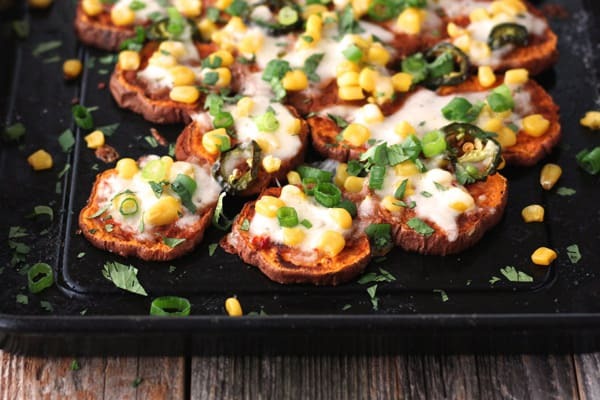 Featuring baked sweet potato rounds loaded with refried beans, melty cheese, and roasted jalapeño slices – they’re spicy, delicious, and guaranteed to be a hit with any sweet potato fan! I have some bad news. Sweet potatoes taste nothing like tortilla chips. The good news is you won’t care. Not. At. All. That’s because sweet potato nachos are fantastic in a way chips just can’t compete with. Don’t get me wrong, traditional nachos are awesome. 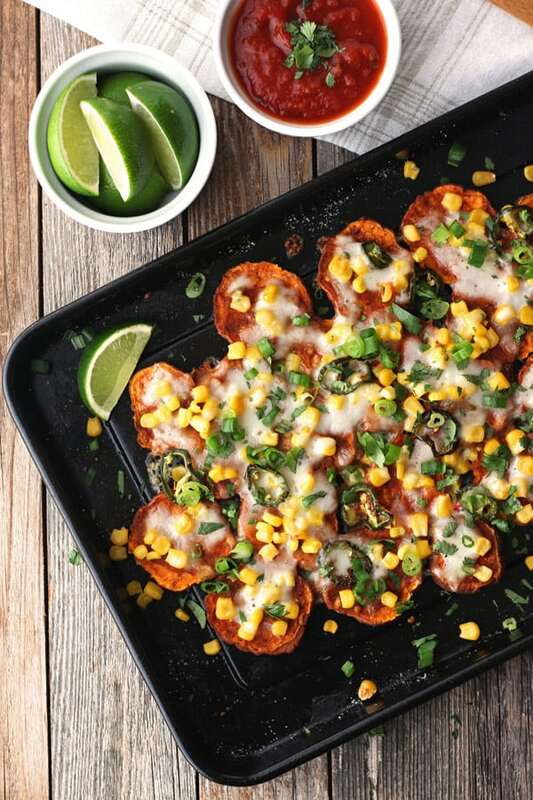 I’d devour a chip-filled tray of toaster oven veggie nachos any day of the week. But for a fan of baked sweet potatoes, these nachos will be a Whole ‘Nother Level of Deliciousness. 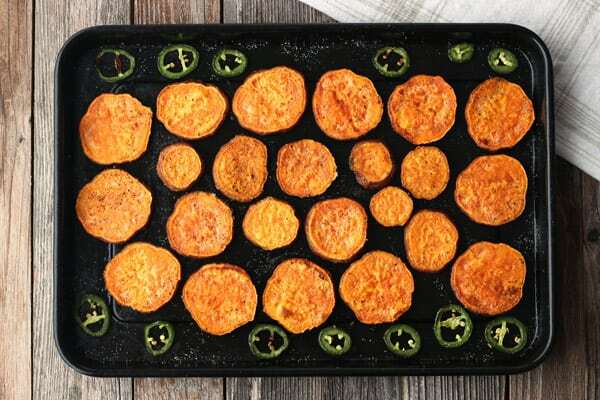 The sweet potato veggie-base starts with the easiest toaster oven snack, roasted sweet potato rounds. They’re lightly crispy on the outside, tender on the inside, and so simple to make. You just slice a sweet potato into ½-inch rounds, oil, season with salt and pepper, and roast. Want to up the “Nacho” factor? Season them with a little cumin and chili powder or your favorite southwestern spice blend. The trick is to cook the rounds long enough so the middles are tender but not squishy. That way they can hold your toppings. For our toaster oven that’s usually about 15 to 20 minutes, depending on how wide/thick the sweet potatoes are. And to make sure your slices brown evenly use a fork or spatula to gently flip them halfway through the cooking time. These nachos taste great without jalapeño so no worries if you’re not a fan. But if you like things spicy, the perfect moment to add your jalapeño slices to the pan is when you flip the sweet potato rounds. It’ll give them just the right amount of time in the toaster oven to get crispy without burning. 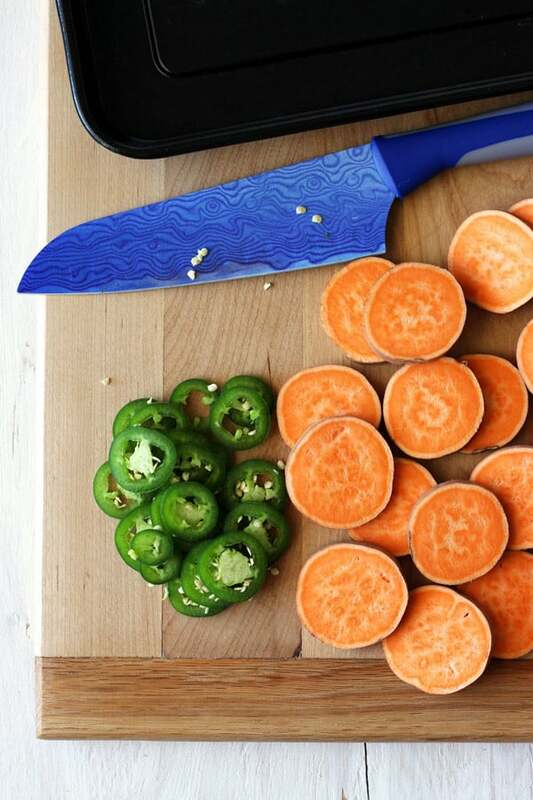 Once your sweet potato base is ready it’s ALL about the toppings. Like these baked egg tostadas, making nachos is an excellent opportunity to clean out the fridge. Leftover vegetarian refried beans taste great with a little enchilada sauce. And who doesn’t like corn? But if beans and corn aren’t your jam throw on your favorite toppings instead. Cover everything with plenty of cheese and toss the pan back in the toaster oven. Five minutes later your nachos will be warmed through and covered in stringy, gooey, melty cheese. Meaty: Add shredded cooked chicken or browned chorizo sausage before the cheese. Dairy-Free: Skip the cheese and top your warmed nachos with chopped avocado and a sprinkle of nutritional yeast. More Veggies: Add fresh baby spinach, leftover roasted vegetables, or chopped bell peppers before the cheese. Finish those already-going-to-be-yummy-nachos with cilantro, green onions, salsa, or anything your heart desires. Lastly, squeeze half a fresh lime over the whole pan. Trust me, it’ll make all of the flavors pop, especially those earthy refried beans. hmmm…did I forget to mention they’re messier too? You’re definitely gonna need more napkins! Looking for more toaster oven appetizer recipes? What a great idea for healthy sweet potatoes! 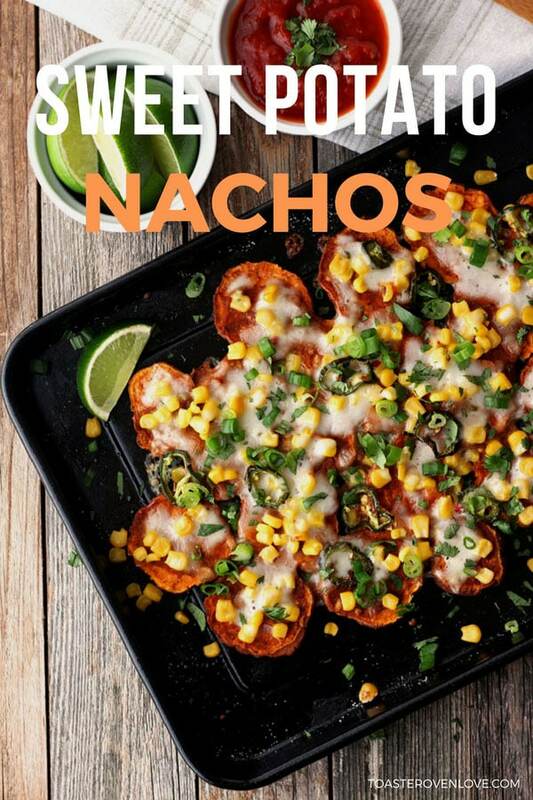 I have never had nachos, so I cannot even compare the two, but I am so sure I would like this sweet potato version. Got to give it a try!